Crim Dell is an iconic little pond tucked away in a forest glade in the middle of William & Mary’s campus. 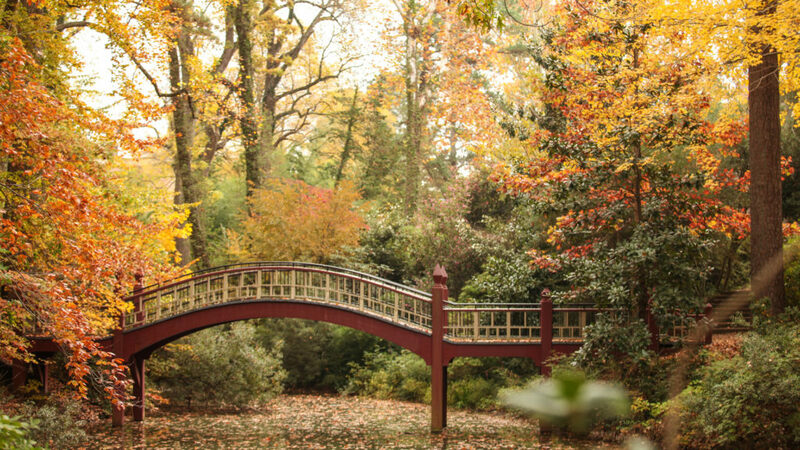 Its arched wooden bridge is frequently described as the most romantic spot on campus. William & Mary’s Crim Dell in the Fall. Photo from William & Mary. Yet, that’s not the case this summer. Crim Dell has recently been drained, and its bottom is exposed for all to see. The resulting scene is as grim as it is smelly. The bottom of the dell is covered in a fragrant mélange of muddy sediment and half rotten vegetation with an assortment of anthropogenic debris. Upstream view of the drained Crim Dell on May, 21st 2018. Thus far, bicycles, bricks, and traffic cones have been discovered in the mud. My favorite find was a red fire extinguisher, nothing quite says “sophomoric prank” like a fire extinguisher stuck in the mud at the bottom of a campus pond! Downstream view of Crim Dell from the bridge on May 21st 2018. Close-up view of anthropogenic sediment at the bottom of Crim Dell. Fear not, things will get better! 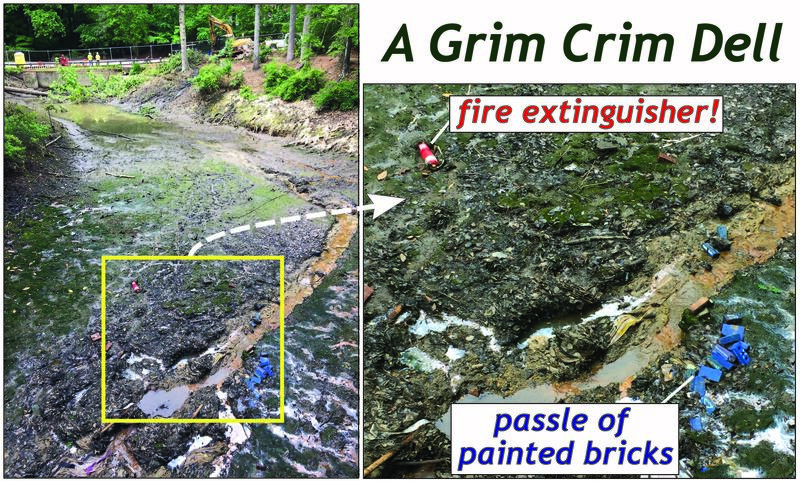 Crim Dell was drained on purpose: it’ll be dredged and restored this summer. 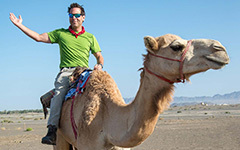 Read all about it in this William & Mary News story. For better or worse, Crim Dell effectively serves as a sediment retention pond for much of Old Campus. 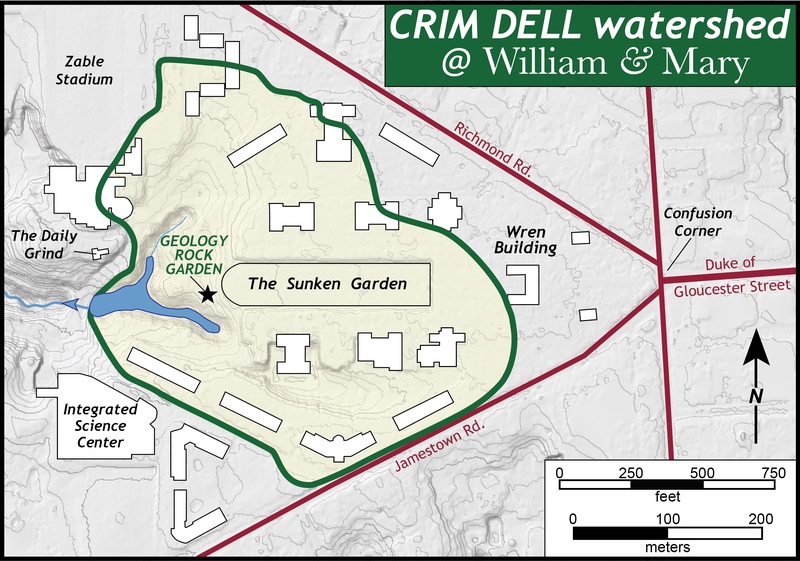 The Crim Dell’s 140,000 m2 (~35 acre) watershed encompasses all of the Sunken Garden, many academic buildings, some dorms, and Geology’s rock garden. It’s tricky to determine the full extent of the Crim Dell watershed as its upper reaches are flat and form a subtle drainage divide. Much of the water that flows into Crim Dell is plumbed through a series of pipes that funnel runoff from buildings, parking lots, and brick pathways. Collectively, it’s not a particularly natural watershed. The Crim Dell watershed at William & Mary. Not all campus buildings are illustrated on this map. Map constructed from 1.7 meter pixel LiDAR data, gray lines on the map are contour lines (2’ interval). Notice the flat terrain at the upper reaches of the Crim Dell watershed. Thomas Jefferson never frolicked in Crim Dell as the pond was constructed in 1966, and its iconic bridge was added somewhat later. In 1993, the pond was drained and dredged with ~1,500 m3 of silt being pulled out of the pond. The 2018 operation will remove sediment and install a suite of bubblers to better aerate pond waters as well as add gabion baskets to trap sediment at the upper end of the pond. When rain falls on Old Campus, the runoff with its load of sediment and pollution ends up in Crim Dell. In 2015-16, Geology major Annabel Hess and Professor Randy Chambers obtained sediment cores from Crim Dell to investigate sedimentation rates and analyze the chemical composition of the mud. Annabel Hess ’16 and Professor Randy Chambers deftly extracting a sediment core from Crim Dell in October 2015. Photo by Daniel Dores. They obtained 4 cores from different parts of the Dell, and the sediment in the upper 10 to 25 cm (4 –10”) is a blackish-gray organic-rich silty mud. Most of this sediment was likely deposited since 1993. There is a hefty amount of nitrogen and phosphorus bound up in the sediment, which originated from the fertilizer that the university applies to places like the Sunken Garden. William & Mary wants green grass on its campus, and to achieve that goal, it liberally doses campus with fertilizer. This produces a heavy nutrient load into Crim Dell that facilitates the growth of algae in the pond. When the algae (and other organic debris) die and rot decomposition depletes oxygen in the pond waters. For decades Crim Dell has been a eutrophic pond with characteristically murky green-brown water. The university has already done some work to remediate environmental conditions in Crim Dell by installing a bubbler to aerate the water thus increasing the dissolved oxygen content. In the past, floating bio-mats have been installed to trap nitrogen. 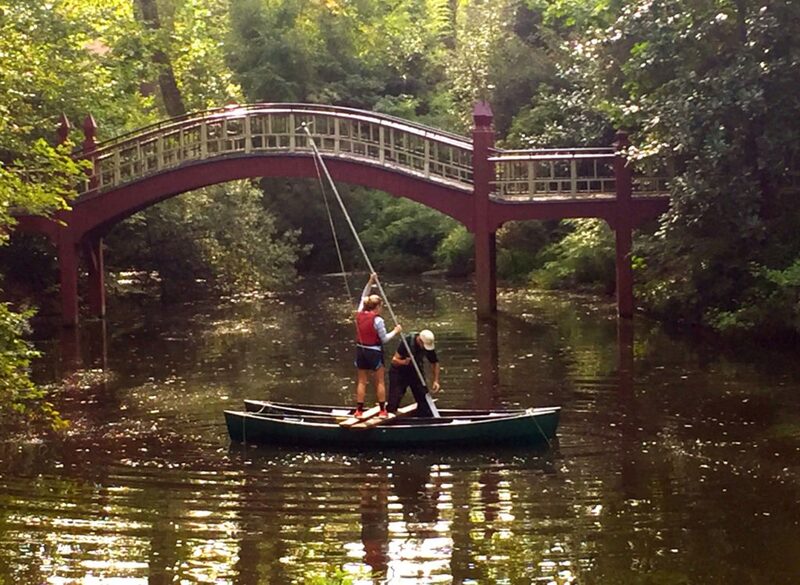 W&M’s Student Environmental Action Coalition (SEAC) has garnered funding to help restore Crim Dell, and in the past few years has made much progress removing invasive vegetation. To beautify and grow a verdant campus W&M applies fertilizer, which in turn pollutes Crim Dell. Yet, to maintain Crim Dell as a scenic spot W&M awards sustainability grants to remediate the damage that its land use practices create. There is a curious dualism at work here. At the institutional level does the right hand know what the left hand is doing? More to the point — does anybody actually care? It’s both admirable and important that William & Mary is investing in environmental stewardship on its on campus, but we need to recognize W&M’s role as an environmental polluter. 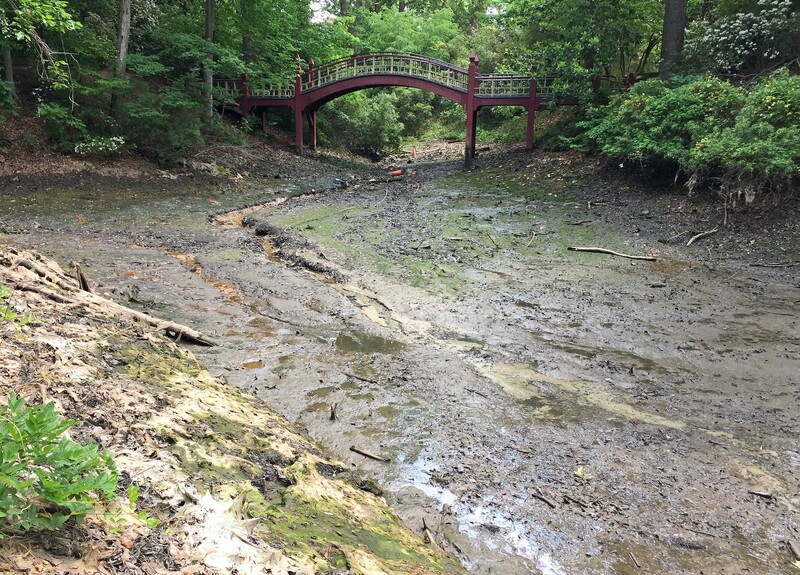 Crim Dell serves as an important repository for some of the sediment and pollution generated here on campus, and as such, keeps those materials out of the James River and Chesapeake Bay ecosystems. Dimensional analysis is a standard and basic scientific method that utilizes physical quantities such as length, mass, time, etc. to solve problems. We use it with great frequency in William & Mary geology courses/ problem sets. During the 1993 dredging of Crim Dell it was reported that ~1,500 m3 of muck was dredged out and hauled away. The surface area of Crim Dell is 1,800 m2 (based on a GPS survey carried out by the 2017 Geology Field Methods class). That implies that the average depth of material removed from the entire surface area of the Dell was 0.833 m (~3’). W&M News reports that 900 truckloads will be carted away this summer. A typical dump truck can haul ~10 cubic yards of dirt (7.6 m3). So 900 truckloads yields a volume of 6,840 m3. On average that would mean Crim Dell would be excavated to a depth of 3.8 m (~12.5’). Whoa! With that increase in the Crim Dell’s depth, the university ought to set up a few high diving platforms! Can this be so? This estimate seems way too high. From this quick analysis, it seems as though 900 truckloads is far too many. I wonder how W&M is being billed for this job? Edit: I’ve since learned that the muck-carrying trucks will be smaller than the standard dump truck and given the soupy nature of the sediment will be carrying half-loads. That significantly reduces, by 1/2 to 2/3s, the total volume estimate of material that’ll be carted away from Crim Dell.